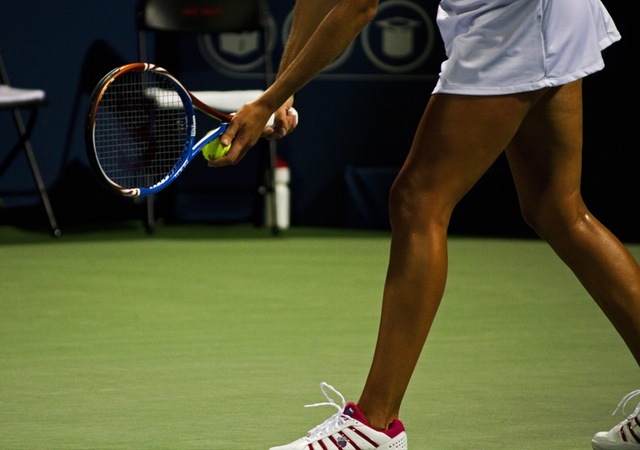 Amateur and professional tennis players alike are prone to injuries of the foot and ankle, both of which suffer from repeated lateral motions and quick stopping and starting. Tennis injuries can be painful and lengthy. The best way to get better and get back on the tennis court is to see a doctor immediately after an injury or as soon as you notice pain. We treat patients with tennis injuries in our office. The most common injuries we see include ankle sprains, stress fractures, plantar fasciitis, and tennis toe. Sudden bursts of motion from side to side can greatly impact the ankles and feet. The repeated motion puts a lot of tension and pressure on the tendons and ones on the feet and ankles. Stretching your feet and ankles before and after a tennis match will help to prevent injuries. The hard pressure of most tennis floors can also be very strenuous on the feet and ankles. Clay and crushed stone courts help players slide better, and are considered the safest surfaces on which to play. Asphalt, concrete, rubberized, or carpeted courts don't allow sliding, and are not as healthy for your feet. Wearing proper tennis shoes, rather than running or walking shoes, can help to offer better support while playing. If you experience recurring or persistent pain, contact our office. Piscataway (732) 968-3833 Hillsborough (908) 874-8030.